Chiltern Lodge is versatile. Book 1 cottage for up to 6 people OR book as many cottages as you require depending on your group size. Maximum 24 people. Chiltern cottages are well appointed, spotlessly clean and fully self contained with cosy log fires . Each cottage has 2 bedrooms, sleeps up to 6 and all are thoughtfully equipped as a true "home away from home"
Hidden in the bushland of Khappinghat National Park on the NSW Mid North Coast. 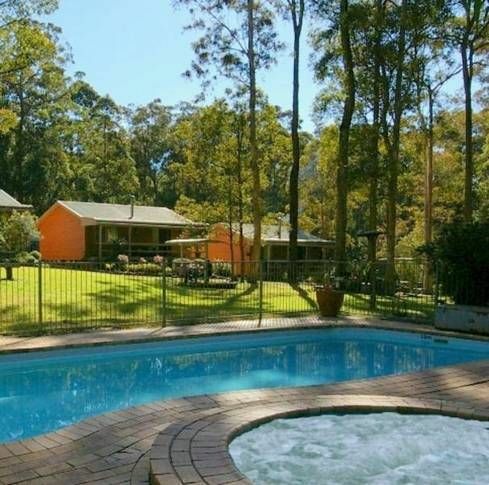 A comfortable 3 hour drive north of Sydney, award winning Chiltern Lodge offers the best of both worlds - a secluded 11 hectare forest hideaway yet minutes from the beautiful Manning River, unspoilt beaches & 7.4 km to the seaside village of Old Bar. Chiltern Lodge is a year round holiday destination for all ages and lifestyles. We are ideal for romantic escapes, family fun, health and fitness. Our venue is perfect for small group getaways, family reunions, sporting groups. Four well appointed cottages in a tranquil forest setting that offer the perfect ambience for rest, relaxation and rejuvenation. The cottages are offset for privacy with comfy cane lounges on each front veranda - a great place to relax, unwind and enjoy the tranquility of our bushland setting. There are BBQ's for outdoor dining and covered seating for each cottage. Adjacent to the pool/spa and recreation room you'll also find a large undercover outdoor pavilion with BBQ and fireplace. Ideal for communal dining and toasting marshmallows with the children. Chiltern Lodge is a popular venue for small group getaways.It is a great choice for family reunions, reunions,sporting groups. By booking all 4 cottages you will have the whole retreat to yourselves! Your stay at Chiltern Lodge can be as active or as relaxed as you like. We have lots of onsite activities eg: fitness training to suit all levels & ages provided by Chilterns' own personal fitness trainer, bikeriding & walking trails. Swimming pool and heated spa and a large park area suitable for family cricket or kicking the footy. Volley ball, bocce and the recreation room with billiards & table tennis. If you just want to relax how about being pampered at Chiltern with our masseuse Don. Have a massage in the privacy of your cottage or beauty treatments at nearby Nojee Day Spa. We can arrange all bookings for you. Laze by the pool or have a snooze in a hammock. A 7 minute drive and you are at the seaside village of Old Bar and the pristine beach & lagoon of Saltwater National Park. The Manning River is close by for those who fish and the hills of the Manning Valley are waiting to be explored. You will love the natural beauty of the area. For the more adventurous, nearby activities include kayaking horse riding, skydiving, joy flights & fun parks. Clean & comfortable venue, great facility for our group of 16. Individual cabins for privacy, outdoor kitchen, swimming pool and rec room for entertaining and socialising. Local activities kept the kids and young adults busy during the day with family catch up time at breakfast and dinner. My parents loved the disabled cabin facilities making the venue suitable for ALL ages. We had one weekend away with weather that gave us an opportunity to swim (sunny) and huddle by the outdoor fire (stormy afternoon). Unanimous vote to return for our annual family Xmas. Points to note, take Mozzie spray just in case and if coming from the south don't listen to apple GPS, take the Taree exit and follow the signs to Old Bar. Such a great place to stay. Separate cottages for each of our families to stay but great communal areas for us to enjoy each other's company. The kids had a great time- we didn't have one complaint of being bored. Something for any age which ranged from 1-11years. So well equipped and maintained. We have no hesitation in going back and can't wait to do so. Thanks so much for the kind words and what a lovely group of families, a pleasure to have you stay and we welcome you back anytime. The staff were lovely and the accommodation was lovely. I have recently celebrated my 50th birthday. I decided on Chiltren Lodge. There was 17 of us so we had the retreat to ourselves.What an incredible 3 days all those small details that really do matter were ticked and then some. I can not recommended it highly enough. A huge thankyou to Lindy & Rob and Mike & Vicki for making my 50th so memorable for all the right reasons.